The Policing Project recently visited Austin, Texas, as part of our national field research project with our partners at the National Police Foundation and National Urban League. We are visiting cities across the country to learn about their approaches to police-community engagement, and the challenges and successes they’ve encountered along the way. Protest and civil disobedience following police use of force incidents can open the public’s eyes to policing’s impact, particularly on communities of color. But for as forcefully as these demonstrations can bring attention to an issue, they can sometimes lack clarity about specific, actionable solutions. Austin, Texas has seen its fair share of police-related protests and civil unrest. Yet some community groups in Austin have also used their influence and leverage—earned from effective organizing and advocacy—to work directly with city leadership and Austin Police Department (APD) officials to reform and improve policing. Alongside the critical work of organizing communities and publicly advocating for change, these groups have sat and engaged in direct policy conversations with stakeholders like APD. After a fatal police shooting in 2016, the Austin Justice Coalition (AJC) set out to revise APD’s use of force practices. To research best practices, AJC convened reading groups and assigned “chapters” of President Obama’s 21st Century Principles of Policing and the Police Executive Research Forum’s Guiding Principles on Use of Force as homework. They also reviewed policies from other police departments across the country. 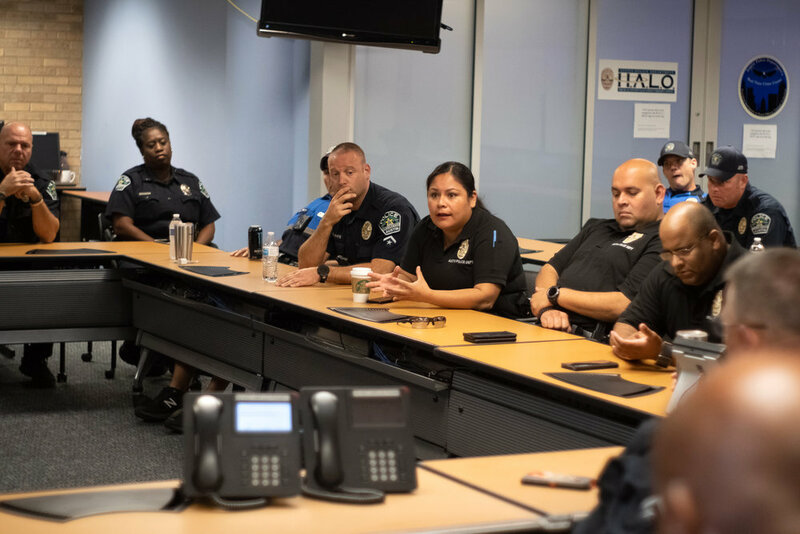 AJC then convened regular meetings to discuss what they learned from their readings and what they would like to see in APD’s use of force policy. AJC’s policy group became so well-grounded in the case law and best practices on use of force that their proposed policy, after being sent to the chief of police, was accepted and put into practice by the department with only minimal revisions. With a strong subject matter understanding, Austin Justice Coalition has worked (if at times uneasily) with city leadership, police officials, union representatives, and other stakeholders to revise departmental policies, negotiate reforms, and deliberate over oversight models. A meeting between APD Community Engagement Officers and District Representatives. In June 2018, responding to concerns about over-enforcement of low-level crimes, the Austin City Council directed the city manager to reduce racial disparities in APD’s use of discretionary arrests for certain non-violent misdemeanors. The city manager convened a working group, including community organizations like AJC and Grassroots Leadership, to review the APD’s misdemeanor policy and other related policies. Across a series of meetings, the working group debated policy provisions and worked through numerous drafts. There wasn’t consensus on everything—including the issue of driving with an invalid license—but the resulting new misdemeanor policy, which went live on November 1, 2018, reflects substantial changes from community input. The new policy reduces factors that disqualify someone to be eligible for a citation, thereby giving officers more latitude to issue a citation and release the individual without an arrest. The policy also extends guidance that “officers shall select the least intrusive and severe method when considering issuing a citation in lieu of an arrest” from only Class C misdemeanors (the least serious of misdemeanors) to more serious Class A and B misdemeanors. With a seat at the table comes the responsibility of maintaining openness and a willingness to work with others even in the face of fundamental disagreements. It requires uncomfortable and difficult discussions. But it ultimately means that community advocates gain more influence and decision-making power. It also means that policy decisions reflect the desires and concerns of the communities that they affect. At the Policing Project, we call this a great step toward democratic accountability.